Urethane concrete prices are more competitive than ever. With global epoxy resin prices fluctuating since the fall of 2017, experts are keeping close watch on how price increases are affecting the construction industry. The rising cost of gas and petrochemicals is raising the production cost of epoxy resins. Together with a nervousness among consumers over epoxy availability and growing environmental concerns relating to some raw materials, industrial contractors are more likely to consider alternative products for projects such as high-performance industrial flooring. For example, now that prices are equalizing between epoxy and urethane concrete, it makes considering a seamless, resinous, cementitious urethane flooring system a more affordable option – and possibly the best choice for your company. Dominating the world demand for urethane products is the construction sector. This industry accounts for 30% of the volume share of urethane produced in 2015. Urethane is in everything from insulation and roofing to flooring. In 2017, U.S. demand for urethane products rose dramatically, due to reconstruction efforts after a series of hurricanes and wildfires devasted parts of the country. The development of environmentally-friendly urethane coatings, with polyaspartic and 2K waterborne PU technology, is expected to account for over 15% of all the urethane sold by 2025. These innovations help make food and beverage facilities safer and more efficient. Urethane continues to be a significant factor in sectors like electronics and medicine as well. Products such as UCRETE® and Flowfresh from Surface Solutions’ partners BASF and Flowcrete Americas provide flooring solutions that can transform any environment, especially in the food and beverage industry. Epoxy Flooring Systems – refers to polymer, or resinous, floor coating systems that utilize one or more polymer technologies like epoxies, urethanes, polyaspartics, methyl methacrylates (MMA) and vinyl esters in conjunction with each other to meet specific project requirements. For example, your floor coating solution could be comprised of an epoxy primer and chemical-resistant urethane. Urethane Concrete – an industrial concrete floor coating that utilizes urethane resin technology to bind engineered cement powder aggregate powders, creating a high-performance floor surface. Urethane concrete systems exhibit excellent chemical, impact, abrasion and thermal-shock resistance. Epoxy Mortar – blends high-performance polymer resin with custom-blended aggregates or concrete powders for heavy-duty protection of concrete substrates. Epoxy mortar is also an excellent choice for resurfacing badly damaged concrete with a long-lasting, stronger concrete cap. Epoxy mortar systems exhibit excellent durability, adhesion, abrasion and impact resistance. Polyaspartic Floor Coatings – a 100% solids, solvent-free, fast-curing topcoat that allows a shorter downtime; moderate foot traffic in as little as four hours after installation. Polyaspatic flooring coatings exhibit superior UV-resistance, good overall chemical and abrasion resistance and very low odor. 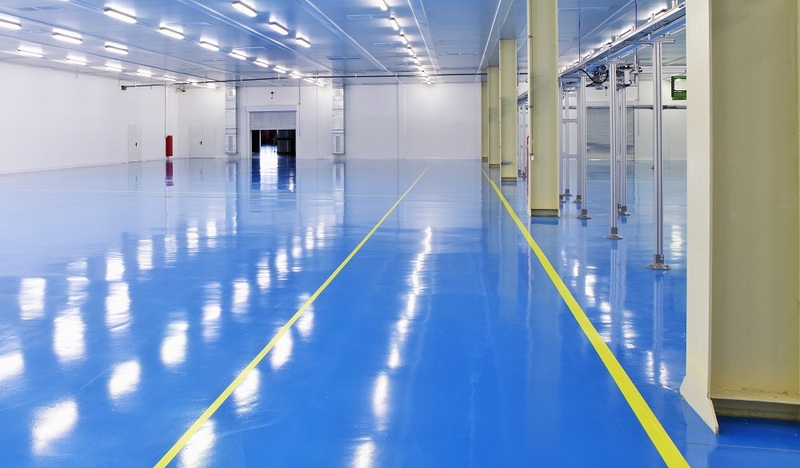 Urethanes – a high-performance topcoat over an existing urethane floor or epoxy coating. Urethane floor coatings exhibit excellent chemical resistance, UV stability, light reflectivity and resistance to hot or cold tire staining. Recognized as a top UCRETE® Master Contractor since 2012, Surface Solutions, Inc. is a women-owned independent industrial floor contractor specializing in seamless, polymer flooring systems utilizing the most trusted brands in the industry. As a Flowcrete STAR Contractor, Surface Solutions, Inc. is a leading provider of industrial flooring solutions for the Food & Beverage industry. From testing to consultation and complete installation services, Surface Solutions is your premier source of non-toxic, safe and environmentally friendly flooring systems, offering turnkey installations using only in-house personnel. All installations come with a complete single source warranty. To learn more about how Surface Solutions can help provide the highest quality industrial flooring solutions for your business, contact us today!